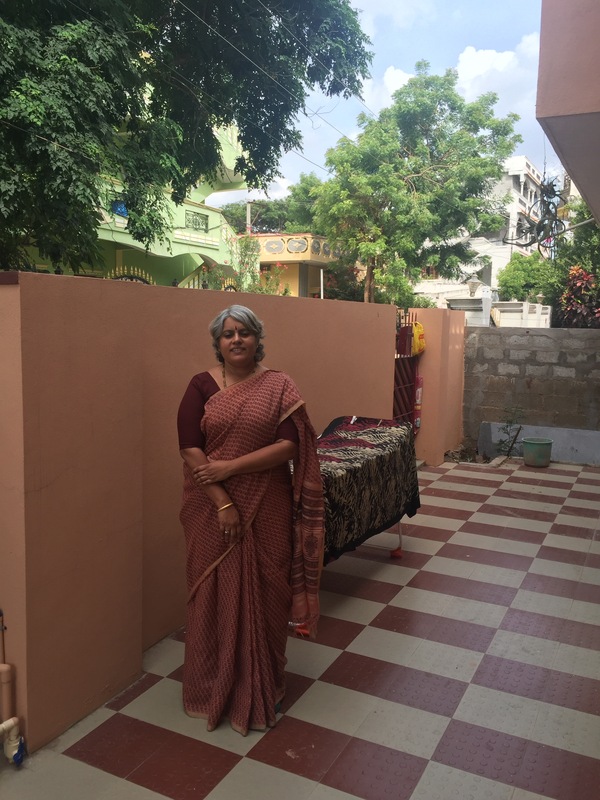 We were in Dindigul and Chinnalampatti for our second meeting with the weavers’ children on July 10th and I decided to wear a sari that the Dindigul weavers had woven and Amma wore a sari that the Chinnalampatti weavers had woven. I wore this organic cotton that has a 1000 buttas. According to the experts in the W3 group, this type was originally woven in the silk saris and Co-optex has now brought it in the cotton saris. The skill of the Dindigul weavers is obvious – every one of the 1000 motifs are woven … sheer art and real hard work. The pictures below were taken outside the hotel near their parking lot at the back of the hotel. 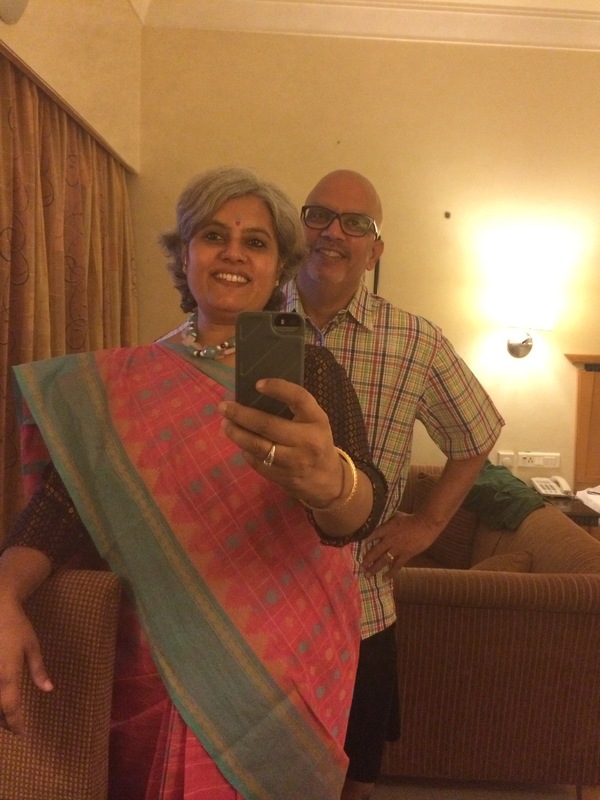 We stayed at Parsons Court in Dindigul and its definitely a hotel that we would recommend. Great service and I don’t say that often !!. Amma is wearing a Sungudi cotton with Warli block print. Just beautiful. My neckpieces are from Desh Maheshwari, Noida. I entwined two strings – the pink rose quartz and the pale blue turquoise or Tourmaline (unsure). This next sari is a stunner and the one that Mr. Rao was very particular that I buy. He liked this more than a black that I had picked up – me and my fetish for black :). Krishnan also liked this more than the black, so I changed this at the very last minute. Bought this during our first visit to Chinnalampatti. 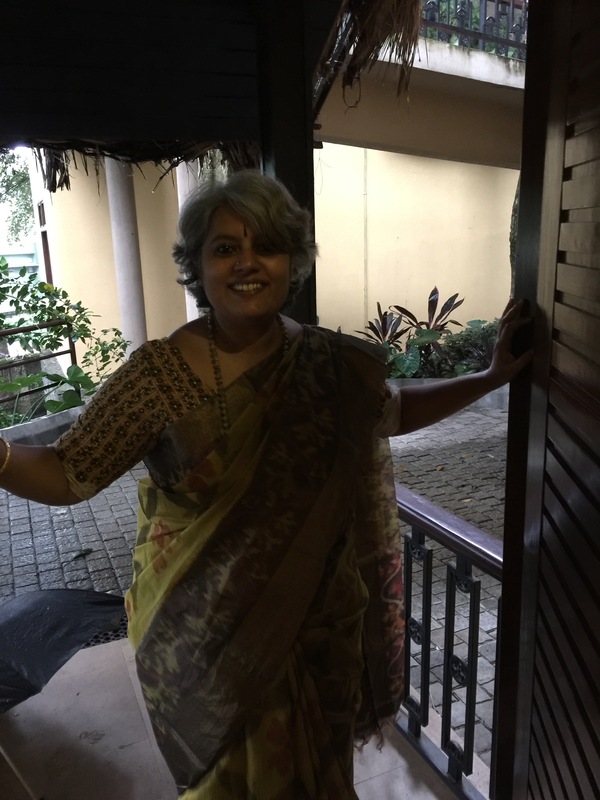 I wore it first at Thekkady on July 8th… yes Geetu, this was my new sari for your birthday :). It was a very busy day as we went to meet Mr. Thennarasu, Director of the Indian Institute of Handloom Technology at Salem. Mr. Narasimhan, MD Co-optex had introduced us and we spoke of different ways in which ShikshaDaan and IIHT can cooperate. I have already worn this sari thrice. 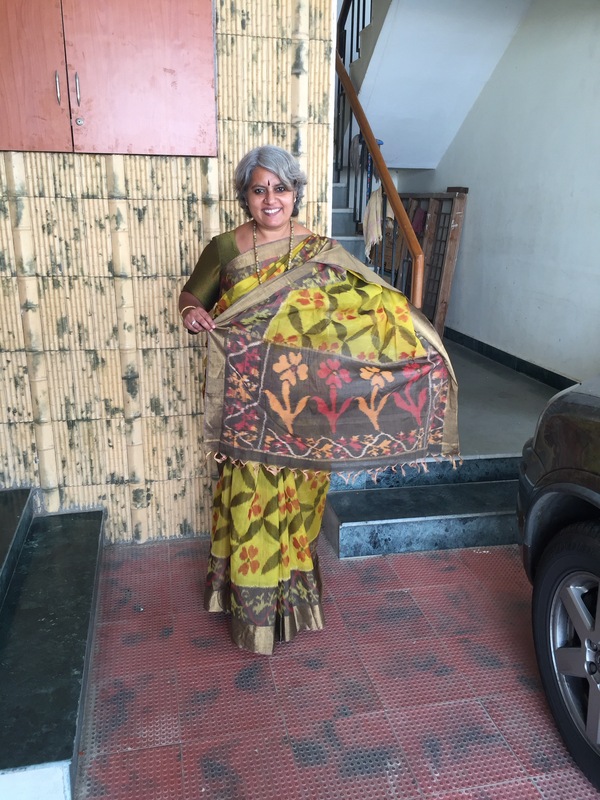 Wore it again on Thursday when we went to the Egmore Co-optex showroom. The best thing was meeting one of the Co-optex employees who had helped us during our meeting with the weavers at Chinnalampatti. He recognised the sari immediately ! The blouse is a Khunn. The first time I wore it with another printed blouse (“ajrakh” print??). The neckpiece is an all time favourite of mine as it fits many saris. This sari has been woven by the amazingly skilled and artistic weavers of Chinnalampatti. The yarn is dyed in the sequence of the pattern and then loaded. 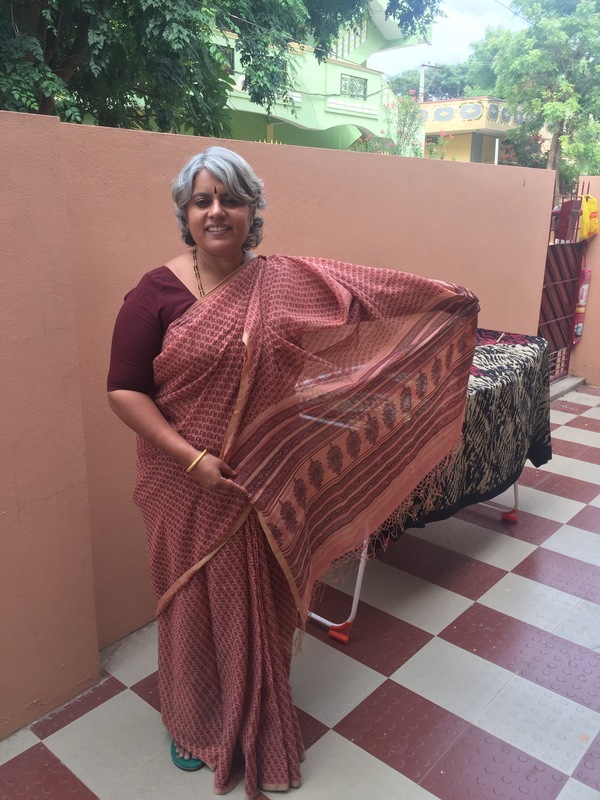 You can mistake this to be a printed sari but its not – the pattern is fully woven and the skill of the weaver is in not missing a single thread. If they make one mistake the entire sari has to be discarded. I don’t think I can understand the complexity fully, but I can and do appreciate the art tremendously. 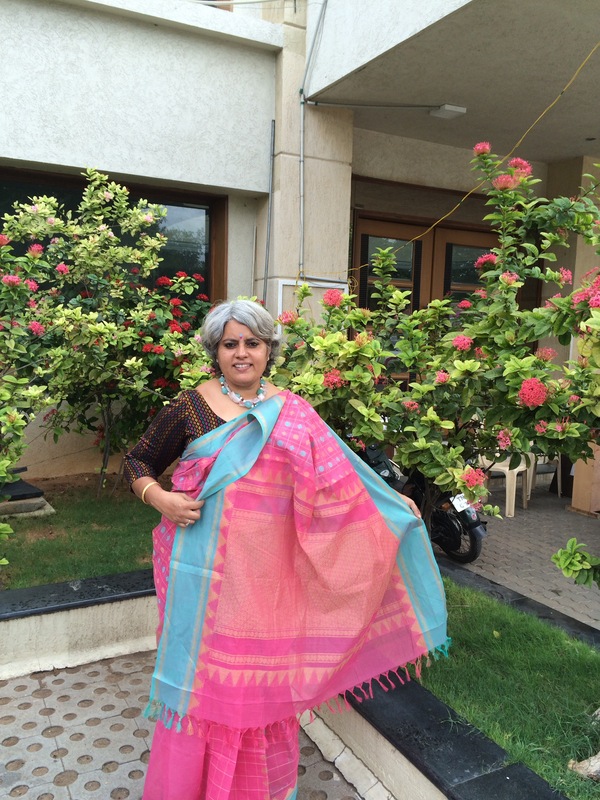 Its a silk-cotton sari and I didn’t want to get out of it. The designs I was told are inspired by Pochampally. Anu Varshney, you got me to wear this Kota doria ! I saw your picture on Facebook and remembered this one that I bought at “Kalpana”, Gurgaon. Its the softest cotton and drapes like a second skin. The color is so lovely and this is one of Krishnan’s favourite saris. The sari that is drying on the rack is a crepe in a Satya Paul inspired print :). Washed that in “reetha” or soap nuts water today. Btw I read on the net that kota doria used to be called Masuria as the weavers were originally from Mysore. The weavers were relocated to a town in Kota by a general in the Mughal army. History is fascinating. Absolutely love you in all three sarees. The Chinalampaty is so versatile – looks good with both the blouses. The aiyram butta – please get another blouse for it Tweeno ❤ The saree is gorgeous. You have to get one for me in exact same colors if you happen to go to Dindigul again! Love love love you in that pink number! 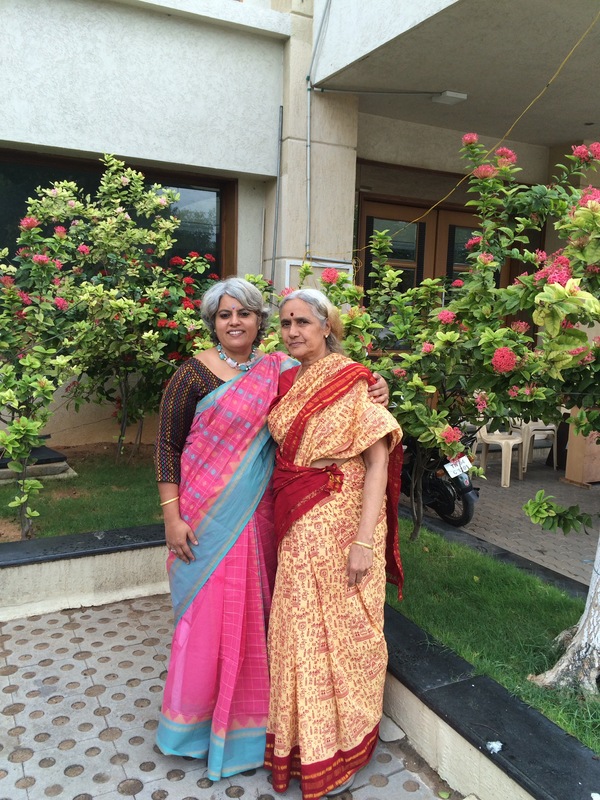 Aunty is lovely and totally rocking her Sungudi. Y'all are such beautiful people working for a great cause. All the power to you guys and much love. Thanks Anu. I do have both the blue and pink coloured blouses with me for the Ayiram butta, but didn’t bring them during this trip. So will change it next time 🙂 and will also try and get you another one of the same colour. Mom’s always rock and yours and mine have such rocking daughters, hahahahaha. cheap thrills as a professor of mine would say.